Present: Vicky S. & Aria from Motherland, Magnolia, Judith, Alison, Karin and 3 new participants: Antigone, Kathy Holmes and Jennifer Lang. Farmer’s Market Pod – currently having a stall at the Willits farmers market every Thursday and collecting donations for product displayed (Fire cider, fresh herbs, Vicky’s booklet etc.). There is also a clipboard for farmers and medicine makers to connect regarding their needs. Fire Cider Pod – Making fire cider that is 90% locally sourced and of mostly donated materials and labor. Cider vinegar, honey and bottles/labels cost and so far, this is where the profits are going. Medicine Collective Pod – working on connecting medicine makers to farmers who can grow what they need. Current county-guild project is coming up with a standard process for growing quality herbs and then trainings to help farmers understand how to do this. Anyone who wants to become involved in this can contact Vicky S via MCHG FB page or website. The inland group is meeting the last Wednesday evening of every-other month in Willits. Next meeting is August 29th at the Willits grange, all welcome! During this discussion, the coastal group suggested another cider making operation could be on the coast to keep up with production and get product in wider distribution. Possible commercial kitchen to use would be the Caspar Community Center. The Elk Community Center is working on commercial-kitchen status. There is also one in Ft Bragg that is considered more expensive. Karin will start the fire cider sales at Corners of the Mouth and also on the first Friday Mendocino Farmer’s Market. 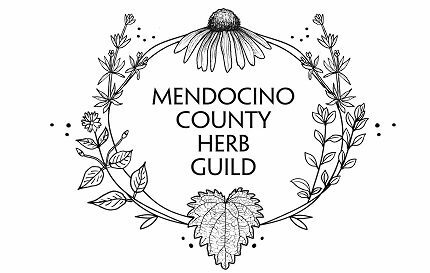 Anyone who wants to help or donate starts or herb books to first Friday Mendo market, please contact Karin! Herbal clinic is still in seed-stage but currently being watered by the recent connection to nurse practitioners; Linda Jo Stern and Faith Simon who are starting a Street Medicine Clinic in Ft. Bragg, mostly centered on helping those in need to become eligible for medical care. Karin verbally suggested to Faith that the MCHG could provide the care portion of clinic in basic comfort treatments and give away herbal teas, salves, non-alcohol tinctures. Faith said she would take this to their board for discussion. Karin will follow up with her this week. Current call to action – fire emergency. Last year Mary Pat lead a medicine-making for fire-fighters and survivors party and now it is time for another! We need someone to step forward as primary organizer to put together in the next 2 weeks (Karin will be out of town) – volunteers needed! The Caspar community kitchen or Elk community kitchen can be approached for use for a one-day medicine making event on a by-donation basis. Karin will call those centers this week to find out the possibility. Alternatively – if anyone wants to donate their own large kitchen toward this end – please do! Vicky will order salve and tincture bottles this week with guild money, enough for coastal and inland medicine-making groups. We now need to collect donations of already made tinctures of respiratory and nervous system herbs. Also, donations of olive oil, beeswax and sticky labels are needed. As of now, contact Karin at 707-937-2798. ‘Get rid of Glyphosates’ movement is held in visionary stage until September. But plan of action is to continue to individually approach businesses in your area that are selling Round-up and asking on behalf of health and safety not to do so. Karin and those interested need to put together a document of citations of scientific support that can be given to store owners. It would be most effective if this was in the form of a letter from a coalition of groups who support the banning of Round-up, for instance local Bee groups, MCHG, Farmers etc (Charlie Acker is a good contact for this). Some businesses have stopped selling glyphosphates and as we compile a list of those who have, Sakina suggested in a past meeting that an advertisement thanking and listing those businesses could be impactful. Eventual goal is to get a county-wide initiative on the ballot to ban this chemical. Final discussion was on managing mailing lists that are collected at farmers markets and events. Magnolia offered to input sign-ups collected on paper on the coast to Mailchimp list and Vicky and Aria will do the same for inland lists. Generally getting folks to sign up directly is best. Avenues of contact are: Mendocino County Herb Guild Facebook page (there is also a FB group page) and www.mendocinoherbguild.com – please take time to occasionally check postings on these sights as they are up-dated for current events. Also you can view our new grant proposal video which is beautiful and inspiring! The logo design and mission statement can be used in advertising and promotional materials – maybe bags, t-shirts etc. Karin adds note now: Might be valuable to design a postcard-size ‘biz card’ that is plant beauty on one side and on the other side: mission, avenues of contact and example of how to be involved on the other – something easy to give away and for people to keep, refer to and remember to sign up.